Religious and Political Meaning in the Pre-Raphaelite Landscape: Hunt's "Strayed Sheep (Our English Coasts)"
William Holman Hunt painted Strayed Sheep (Our English Coasts) on the south coast at Fairlight in the summer and autumn of 1852. Charles Maude first commissioned the image as a replica of the sheep featured in the background of Hunt's The Hireling Shepherd. However, Hunt later decided to make the image into a separate painting that became known as his finest landscape and a brilliant example of the Pre-Raphaelite painting that coupled elaborate realism of landscape with an intrinsic religious and political meaning. 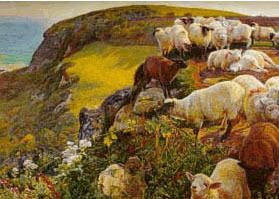 The image uses characteristically bright Pre-Raphaelite colors to depict a scene of sheep grazing near a rocky slope on the southern English coastline. To the viewer's right, a group of sheep huddle together in the background, while a closer pair lies in the rich red soil and patchy grass, bathing in the full sunlight that illuminates the glowing green and yellow of the slope. In the foreground, one sheep has strayed further over the edge than the others, and appears resignedly caught in thorns, brambles, and heavy undergrowth. Several other sheep wander over to follow the entangled sheep's example, perhaps wanting to snack on the leafy foliage, tantalizingly painted in high vegetal detail. Hunt reveals the shape and texture of each individual steam, leaf, flower, and butterfly as the sunlight bounces off and becomes lost in the shadowy depths of wild growth. Sunlight highlights the details of each specific sheep's features, from the veins in their glowing pink ears to the particular texture cast by the sunlight reflected off each variance in their wool. Hunt contrasts the intense realism and naturalism of the detail on the right side of the image with a slightly softer portrayal of the slope on the left, which he captures in the duller browns and greens created by shadow. The distant slope plummets into a patch of white froth that melts upward with the radiant azure blue of the sea. Finally, the sea blends into a hazy white sky that extends in a narrow line across the top of the painting. The image as a whole reflects Hunt's fidelity to the Pre-Raphaelite idea of faithfulness to nature achieved by painting out of doors in broad day-light. Hunt labored to create a natural realism by means of elaborate attention to detail, and then went on to further the implications of his work by combining an accurate physical representation with a mixture of political and religious satire. The vulnerability of the sheep that stand exposed on the cliff of the coastline, already wandering into trouble, suggests that Hunt might have intended to mock the political leaders who left the nation of England vulnerable to foreign invasion. Similarly, a religious interpretation might lead viewers to understand the image as portraying the folly of absent pastors who left their flock exposed to Papal or Roman Catholic aggression as well as the possibility of wandering to their deaths. Religious and political readings are both easy to extract from the image, and as it lacks an accompanying text to guide us in more precise interpretation viewers may find it unclear whether Hunt preferred one reading over the other. Hunt's image can be interpreted as representing a combination of England's vulnerability to foreign powers or perhaps perceived French moral relativism, as well as a religious or humanistic vulnerability to a more generalized concept of temptation and the human tendency to become lost in the brambles of life. 1. How does the significance of the sheep in The Hireling Shepherd carry its meaning over into Strayed Sheep (Our English Coasts) — or does it? 2. Why might Hunt have changed the title from Our English Coasts to Strayed Sheep? Does the change in titles shift the viewer from a nationalist to a more religious reading of the image? Did Hunt have a decided intention to convey a religious message more than a political one, or did he intend the simultaneous levels of political and religious meaning evident in the image? 3. Does the absence of text paired with this image make it more or less difficult for viewers to interpret? Why did Hunt choose to attach text to some of his other works, such as The Awakening Conscience and The Scapegoat, but not to this one? 4. Does the heightened specificity and realism of the scene aid in making its political or religious meaning more compelling? If the image had been painted in doors and not from life, would Hunt's Pre-Raphaelite's intentions have been less convincing in the eyes of the contemporary public?